SBM Spiral Classifiers are available in a comprehensive range, designed to fit a variety of classification applications in wide range of industries. 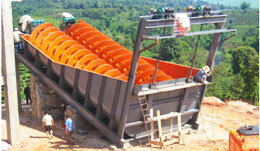 SBM Spiral Classifiers are durable, and offer rugged construction, low maintenance and markedly lower energy consumption. SBM Spiral Classifier has several novel design features for improved performance, operational ease and long trouble free service. SBM Spiral Classifier tanks are engineered to provide the most effective pool area and overflow velocity requirements. By combining the proper submergence of the Spiral with one of the tank designs, a wide range of combinations is possible. (Refer to table on the last page.) The proper combination of pool depth, area and Spiral construction results in controlled turbulence for accurate size separations, efficient washing and/or dewatering as required. SBM Spiral Classifiers can be tailored to suit your needs..
Pre-formed sectionalized steel flights form a continuous Spiral helix. SBM Spiral Classifiers utilize an increased lead or helix angle to form the continuous high pitch Spiral for greater raking capacity. A manual handwheel for raising and lowering of Spiral assembly by a simple positive action, handwheel operated screw device. Manual lifting arrangement are usually provided with smaller size range. Alternatively, spiral assembly can be raised and lowered by a Hydraulic system. Such an arrangement is common for 48” diameter and larger units. The assembly can be provided with a motorized pump as an option for greater operating convenience.